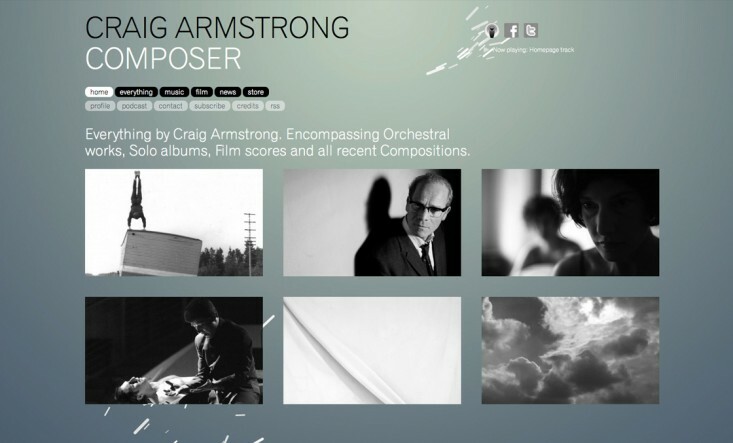 Craig Armstrong — Welcome to the new official site for composer Craig Armstrong. Welcome to the new official site for composer Craig Armstrong. If you’re a fan of Armstrong’s work, or are discovering him for the first time, you’ll find everything you need here to experience the history, the inspiration and the passion behind his award-winning music. Listen to Craig Armstrong’s compositions on his new podcast, or take some time to explore his complete archive of film and music works. You can also buy his solo albums and other recordings in the online store. And of course, don’t forget to stay in touch via our regular e-newsletter and rss feed. You can also follow Craig Armstrong on Twitter.